Let’s now go through the article together and I will make a few comments as we do so. “The comprehensive fall in the price of oil has taken the world’s experts by surprise. Since the summer of 2014 the price of oil has more than halved from over $100 per barrel to a price today of around $50. Last Tuesday the International Energy Agency, IEA, made its first report since the price fall. In the report, the development is described as the beginning of a new era. The IEA’s press release that accompanied the release of the report stated, “The recent crash in oil prices will cause the oil market to rebalance in ways that challenge traditional thinking about the responsiveness of supply and demand”. If we look back in time there were similar price falls at the beginning of the 1980s and in 2008. For economists the price fall were as surprising then as it is now. The interesting thing is that there has always been a good explanation for their occurrence but economists are very poor at predicting when a fall will occur. I have chosen never to predict the price of oil but to say always and only that, “the price will be what the market is prepared to pay”. During the 1990s the oil price even fell below $10 per barrel. It was in 1998 that Colin J. Campbell and Jean H. Laherrère published their famous article, “THE END OF CHEAP OIL” in the journal Scientific American at the same time as The Economist wrote that the world was “Drowning in oil”. See my blog “How cheap is oil today?”. Colin and Jean wrote that cheap oil would reach a production maximum in around 2004 and today we know that the conventional oil, that was cheap in 1998, peaked in 2005. From 1998 until 2008 the price of oil rose from $10 per barrel to $147 per barrel. The era of cheap oil was over. Normally economists interpret such a price rise as a sign of scarcity and in this case we can call this shortage “Peak Oil”. Despite that, there are many who use any argument, no matter how contrived, to assert that Peak Oil lies far in the future. Today, many people regard $50 per barrel oil as cheap and as a sign that we are, once again, “drowning in oil”. According to BP, production of crude oil and natural gas liquids totalled 82.6 Mb/d in 2006. If that production had continued at the same rate during the following ten years then the additional of oil would have raised total production to 92.3 Mb/d in 2013. Instead, 2013 saw total production at 86.8 Mb/d. The increase of 4.2 Mb/d we saw from 2008 to 2013 was not cheap oil. It came from deepwater, from Canada’s oilsands and as NGL and shale oil from fracking in the USA. We can see now that Colin and Jean’s 1998 predictions have proven completely correct. As you can see in the figure, conventional crude oil reached maximum production in 2005-6 at 70 Mb/d and today is down at 67-8 Mb/d if one includes deepwater oil production as conventional. But deepwater production is expensive. If one also includes oil from oilsands and shale oil then the total production rate reaches 74 Mb/d. Note that NGL are not included in these numbers. “A common perception in the oil industry has thus been that the era of ‘cheap’ oil is over. The question is if that perception has been overturned by the dramatic price fall. Kjell Aleklett, a professor in Uppsala and one of the leading researchers behind the theory of Peak Oil, is one of those who do not believe so. “– One must remember that the idea of what is ‘cheap’ oil differs markedly today from what it was 15-20 years ago. During the 1990s a price of around $10-15 was ‘cheap oil’. Today $50 is regarded as cheap but it would have been regarded as sky high back then, comments Aleklett. Between 2005 and the present day the USA’s consumption of oil has declined by 2 Mb/d. Two reasons for this are the blending of ethanol into gasoline and that today’s new cars in the USA use approximately 25% less fuel per kilometre than they did ten years ago. By 2014 shale oil production had grown to approximately 4 Mb/d and if we include condensate the figure is 5.6 Mb/d. Compared with 2005 the USA has reduced its need for oil imports by 7 Mb/d which is a volume similar to the entire export volume of Saudi Arabia. The reduction is by 5.5% per year. A reduction with 7 Mb/d amounts to a reduction of 2.6 billion barrels. During the same period the oil price has been around $100 per barrel which means that the USA’s trade balance sinc 2005 has improved by $260 billion per year. It is mainly this reduced need for imports that has led to the current oversupply of oil on the world market. One way of describing these developments is that OPEC has, for the moment, given up its roll as a price cartel and so-called ‘swing producer’. Instead, they have contined to produce oil at their maximum rate and have allowed the market to set the price. – If the OPEC nations continue to produce flat out then this is an historic change. In that case the organisation will lose, for all practical purposes, its significance, says Aleklett. There has been considerable speculation regarding OPEC’s recent inaction. However, it is clear that the price fall has hindered costly investments and damaged high cost producers – and those oil exporting nations that have become dependent on a high oil price. Russia is such a nation. According to the IEA, Russia now stands before a ‘perfect storm’ with falling oil production as a consequence. Canada’s oil sands are another example. And – to an uncertain extent – the USA’s production of shale oil. In the 1930s there was overproduction of oil in Texas and the price sank dramatically. It was then decided that the Railroad Commission of Texas (RRC) would limit oil transport to a suitable volume in order to increase the price. They did this until the end of the 1960s when the demand for oil finally exceeded production capacity. It was then time to abandon that system. However, it was the RRC’s system that inspired a number of oil producing nations to form the OPEC cartel. When the OPEC nations reach their maximum rate of oil production or no longer care about regulating oil production then OPEC’s main reason to exist disappears. There is no doubt that the fracking industry has reacted very quickly. The basis for the industry is that thousands of new wells must be drilled every year. The company Baker Hughes releases weekly reports on how many drilling rigs are operating and what they are drilling for. 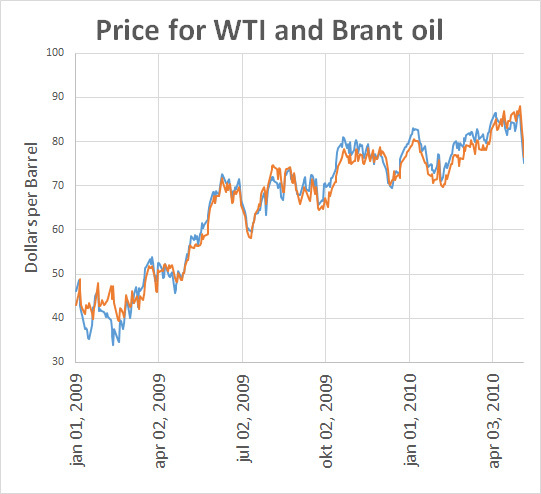 In 2008 the price of oil fell as dramatically as it has done recently. Back then, over half of the operating drilling rigs were idled within six months. 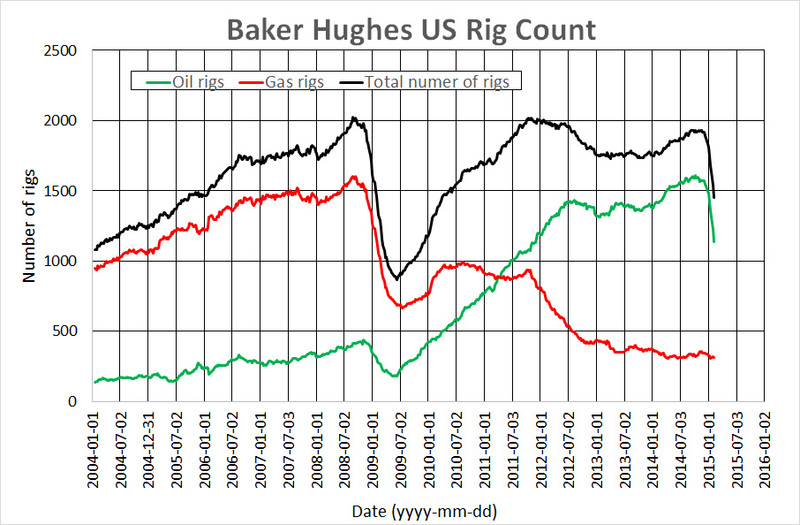 Now, in the last three months we see that 25 % of the rigs have been idled. By summer, certainly half of the rigs that were drilling in October 2014 will be idled and half of the jobs in that part of the industry will have disappeared. 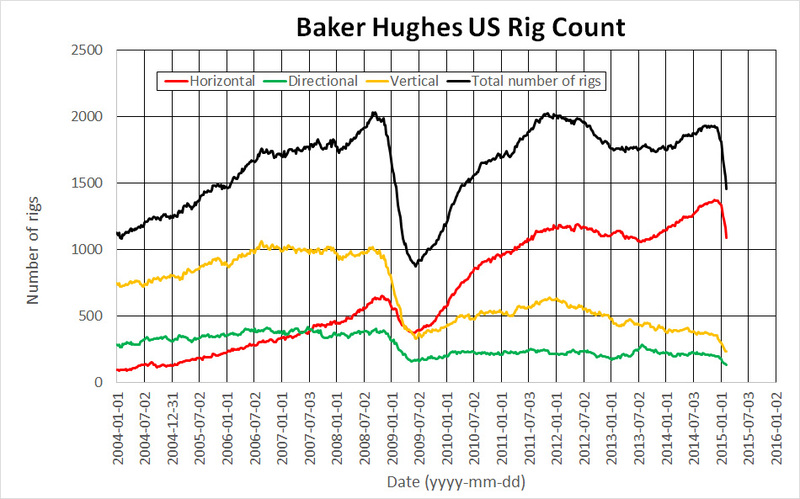 In 2008-9 it was mainly rigs drilling for gas that were idled but there was also a reduction in rigs drilling for oil. If no new wells are drilled then the decrease in production from the fracking fields will be about 40% per year. A few new wells will be opened in coming months but then fewer and fewer. If the oil price stays at the current low level then the USA’s oil production at the beginning of next year will be around 1 Mb/d lower than it is today. The frackers will become the ‘swing producers’”. “With renewable energy advancing and a new global climate treaty in sight in 2015, the question is being asked, who will be left holding the bag when this type of stranded asset becomes reality. According to the article in Nature, the cheapest option for the world would be, in principle, if all unconventional oil was left in the ground. But also 40% of the oil in the Middle East. Tomas Kåberger, the former head of the Swedish Energy Agency and currently professor of energy and the environment at Chalmers University of Technology, is one of those who see the oil price fall and OPEC’s actions as a sign of instability in the fossil fuel industry. That the Middle East’s oil should remain underground because we do not need it in future is still wishful thinking. We see that renewable energy is making inroads and replacing fossil fuels but some of the success of renewable energy sources is due to tax exemptions. Currently, taxation income from the fossil fuel industry is an important part of the budget for European nations. Renewable energy is making inroads into electricity production but there also exists a tradition of renewable energy production by expansion of hydroelectric power. Marginal production of renewable energy is important, not least to put downward pressure on other forms of energy. In that way, subsidisation of renewable energy is a good investment. “So what will happen during the coming year? Will the threat of Peak Oil and rising oil prices be disarmed by technological developments where increasingly cheap alternatives to oil instead begin to challenge the oil industry? Will low oil prices continue – or will prices recover – and, if so, how fast and to what level? “Within the oil industry predictions vary widely. According to Bloomberg the price range for oil in 2015 will lie between $35 and $80 – and during coming years the spread of predictions covers everything between $20 and $200. The uncertainty is greater than seen for a long time. “- If you asked me I would not like to venture a much more precise price range than that. The price of oil has shown itself to be very sensitive, asserts Daniel Spiro. “In its report the IEA is counting on a moderate recovery of oil prices during the next 5 years, to $70-80 per barrel. When it comes to the price of oil I usually do not express an opinion and the fluctuations we have seen in recent years recently show this to be a sensible decision. In the graph you can see how the oil price recovered in 2009. “Maximum production or dwindling oil consumption? Kjell Aleklett is sceptical of the IEA’s future progoses. According to Aleklett neither shale oil nor the price crash of the past six months negate the fact that the world finds itself near Peak Oil. – The IEA assumes that oil production in the world will continue to grow by just over 1% per year. At the same time, production from today’s conventional oil fields is falling steadily. I cannot see how this equation works. – According to Aleklett, there is excessive belief in shale oil’s possibilities. Its production requires the continuous drilling of new wells – something that the price fall is now putting an end to. – The price fall involves two things. One consequence is to freeze investment in discovery of new oil the world over. The other is that it hits US shale oil production hard. I believe we will see a top in shale oil production already this year. Ironically, the fall in the oil price may bring forward Peak Oil. I would not be surprised if maximal world oil production ultimately occurs this year or next year, said Aleklett. To conclude Jens Ergon discusses ‘Peak Oil’. All agree that we passed the maximum of conventional oil production in 2005-6 (see graph abowe). What remains to discuss is so-called ‘natural gas liquids’ (NGL), oil sands and shale oil. The greater part of NGL is used in the chemical industry but the heaviest components of it are blended with oil from the oil sands so make a less viscous liquid that can be transported in pipelines. A large part of NGL-production is a byproduct of shale gas and shale oil production. A reduction in shale oil may bring a reduction in NGL production. Production of oil from oil sands has been hit hard by the low oil prices, but those projects that are underway will probably continue while there will be a dearth of new projects. If the oil price does not recover quickly then production of shale oil will decline in the coming year. 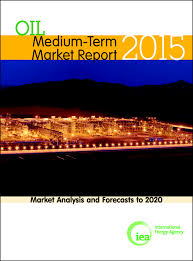 The IEA says in its ‘Midterm report’ that demand, that was 92.43 Mb/d in 2014, will increase to 99.05 Mb/d by 2020. This is an increase of 6.6 Mb/d. 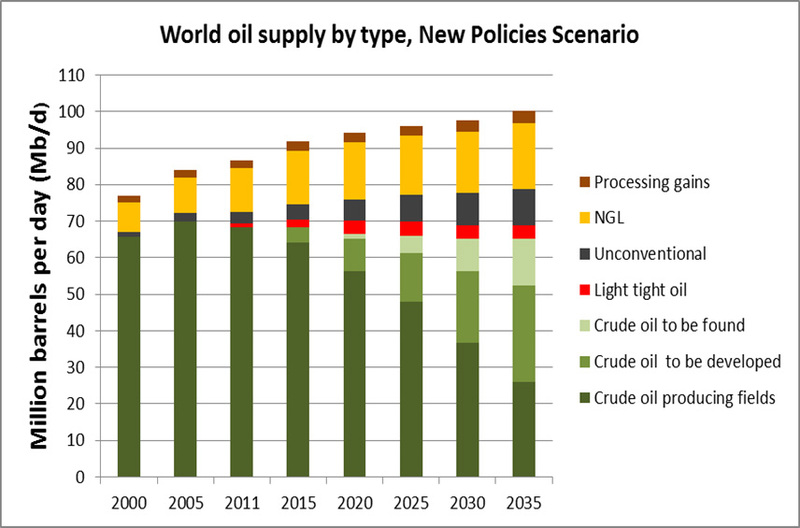 In the World Energy Outlook report they show a collective production decline for all the fields currently producing conventional oil at 6% per year which is the same number that Global Energy Systems in Uppsala reported in 2008. If one considers that currently producing fields will be subject to investment to maintain production then this decline may be limited to 4 Mb/d per year. This means that the current conventional production of 68 Mb/d will decline by 15 Mb/d by 2020. So we can see that more than 20 Mb/d of new production is needed for the demand that the IEA envisages. During this short period there are no new fields that can contribute to this since 6 years is too short a time frame for bringing new fields online offshore, where such new fields normally lie. One field that will contribute new oil by 2020 is Johan Sverdrup in Norway. When it is brought online in 2019 it is expected to provide 0.32 to 0.38 Mb/d. To bring online new production equivalent to 20 Mb/d requires very large investment and the cheap oil that contributes to oil companies’ investment budgets will be decreasing. If they prioritise development of discovered fields there will be less money available to invest in finding new fields. During the period 2020-2030 it will be extremely expensive and difficult to bring new oil production online. There is an economic limit beyond which oil is left underground. The advantage with conventional oilfields is that one has steady (plateau) production for many years and a temporary fluctuation in price thus has less effect on the project. One can even include price fluctuations in the project plan. The year that we reach Peak Oil we will produce more oil than we have ever done previously. We may well feel that the market is oversupplied with oil in that year, just as we do now. The Peak Oil that we now discuss is the peak of unconventional oil production. Since production of this type of oil is very price sensitive the oil market will be a factor contributing to when we reach the global peak of all oil production. There are strong indications that 2015/2016 may see this global peak. In any case, we are certainly on a production plateau compared with the increase in oil production that we saw from the 1980s until 2006. ← Blir sommaren oljepris 70 dollar per fat? That’s certainly true. Predicting the price of oil in the short term is almost impossible because there are too many variables and too much uncertainty. The same seems to apply to predicting future oil production. Estimates are all over the map, and most of them end up being wrong. Lots of people talk about fracking now, but almost nobody actually predicted what happened. No, definitely not. I have the 1998 predictions in front of me now. On page 81 there is a chart showing all oil (including unconventional) beginning a terminal decline around 2004-2005. By now, the supply of all oil (including unconventional) was supposed to have declined absolutely by about 14% relative to 2004, and still declining. That has not happened. The average view among peak oilers indicated absolute declines beginning in 2006 or so. IIRC the very most optimistic predictions from the peak oilers showed absolute declines of all oil (including unconventional) beginning in 2010 or so. Those predictions were not correct. It is interesting that you reference Colin’s Scientific American 1998 article but not his Noroil article from 1988…proclaiming peak oil in about 1989/90 (depending on post peak decline). Taking that peak oil call as a beginning of the modern peak oil mantra, and the roundly derided EIA estimate of 2037 based on the work of Long and Woods using the best available resource estimates available in the world at the time (the USGS 2000 global conventional assessment), leads to an interesting conclusion. We are about 26 years out from Colin’s call, and only 22 years away from the EIA estimate.Closer to one than the other. Of course, we can also pretend that the peak was at about any point in time we wish, by choosing to exclude oil we don’t like, for any reason. From a geologic perspective, there is no difference between a 42API sweet oil from a reservoir 3000′ down onshore versus off. It is a distinction without a difference to the refinery, and used primarily to shift around claims of peak. Most of them invented AFTER it became obvious that prior claims of a peak oil were discredited by time and production rates. Some day a peak oiler will approach the topic appropriately and provide a resource cost curve which can be compared to the 2008 IEA work (2008 WEO I believe, page 218 or 219, Fig 9.10 if memory serves). It is the proper way to answer this question, and yet one never referenced, built, discussed or even considered by peak oilers. Things that make you go mmmmmmm….. Inventories are rear looking, Daily production is forward looking, with larger daily declines as older HZs decline each day, and, rig counts drop each week. It is currently costing Saudi Arabia ~$138 million/day, or ~$50 billion/year.. In particular, the US has accounted for an increase of ~1.4 million bpd yoy of total non-OPEC supply growth of ~1.6 million bpd, or about 82% of non-OPEC production growth. Meantime, world oil demand is expected to average 91.19 million bpd, a yoy increase of 1.0 million bpd. So we’ve got non-OPEC growth (mainly from the US) of ~1.6 million bpd, and worldwide demand growth of ~1 million bpd. With OPEC holding production relatively flat, that means there is an extra 600,000 bpd of oil hitting the market. Referring once again to the latest OPEC monthly report , we see that Saudi Arabia is currently producing ~9.6 million bpd. That equates to 32% of total OPEC production and 10.5% of total global demand. It’s clear Saudi Arabia doesn’t want to cut its production by the 600,000 bpd needed to balance supply with demand. In particular, it would appear the Kingdom wants to find out how strong the new kid on the block is (i.e. US shale oil producers). So what will it cost Saudi Arabia to make its point and get the information it desires? First off, the EIA reports that Saudi Arabia has 16% of the world’s total proven reserves (as of year-end 2013) and is the largest exporter of total petroleum liquids in the world. It is also the largest consumer in the Middle East at about 3 million bpd. That means the country is currently exporting about 6.6 million bpd. So, let’s tally the export revenue numbers as a function of Saudi Arabia’s 6.6 million bpd of exports at today’s Brent close of $70/bbl, and at $60/bbl, versus 6 million bpd (i.e. a cut of 600,000 bpd to balance supply/demand) at a probable price of $100/bbl. It is easy to see that the extra 600,000 bpd of production which would otherwise bring supply and demand into balance is currently costing Saudi Arabia ~$138 million/day, or ~$50 billion/year..
at 10K to 15K a day decline rate, the 600K oversupply will be over in 120 to 180 days, and, …………………….. we are 60 days into it. Predicting the price fall was not hard, I predicted it over two years ago along with the mechanism to cause it. The maximum price customers can afford to pay for fuel decreases while the price required to bring crude to market continuously increases. The current price at any given time is too high, firms fail and customers are left with diminished discretionary income (Greece, Russia, Japan, EU, USA, China). At the same time, the current price is too low to allow drillers to complete the increasing numbers of wells in difficult areas that are needed to keep pace with demand- plus depletion in older wells. High prices strand consumption infrastructure. Low prices strand the drillers … When prices are ‘low’, the high priced reserves become unavailable. At some near point in the future both the too high- and the too low prices will be the same … then it’s game over. From the chart (see link) it looks to be about two years in the future … all else being the same. If conditions change, the price will plunge and oil shortages intensify. Others such as Charles A. S. Hall, Gail Tverberg and Chris Nelder have come to similar conclusions. Use of the fuel does not pay for the fuel, driving a car does not pay for either the car or the fuel. What pays is credit, since 1970’s increasing credit costs have squeezed customers ability to borrow. At some point fuel prices will reflect organic return upon its use rather than availability of credit. Price crash indicates the credit system is broken in the US and elsewhere, bankrupt customers cannot afford to bid = declining prices. Only the smallest amount of fuel use is directly remunerative, less than 10% for commercial, agriculture, transit and emergencies, the rest is incidental/entertainment. Fuel prices have a lot further to fall. Up next is energy deflation: when the customer conserves — whether by accident or on purpose, it makes no difference — the remaining petroleum becomes more costly to extract in real terms. A scarcity premium attaches itself to the real cost of extraction for each new barrel of oil; the result is fewer available barrels as the scarcity premium per-barrel increases. At that point even a decrease in nominal price is exceeded by the scarcity premium. Energy deflation undermines a pillar of conventional reasoning: at some price oil supply is always available. Ironically, ‘use’ of each barrel of oil results in the same increased scarcity premium as conservation. Use puts oil out of reach by destroying it whereas conservation keeps the oil in the ground. At the point where oilfield flows diminish, every barrel out of the ground increases the cost of extracting all the remaining barrels. This is the reverse of how process works leading up to the peak; where each new barrel extracted makes more oil available to extract. By attempting to increase petroleum flows to 90 million barrels per day and more, we undermine the economically necessary process of increasing petroleum flows. We aren’t simply shooting ourselves in the foot, we are cutting off our feet with a chain saw and blowing them up with dynamite!